Ever feel like watching a lackluster romantic comedy? Well, you never know, once in a while you might. For example, to watch some stars you liked in other films. This was the reason I recently checked out Un divan à New York (1996, German title Eine Couch in New York, i.e. 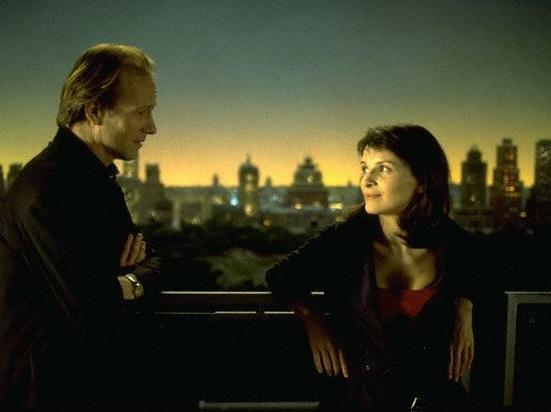 A Couch in New York) with Juliette Binoche – co-star of Johnny Depp in Chocolat (2000) – and William Hurt, who had impressed me in The Accidental Tourist (1988). That's how this love story with a complete lack of chemistry begins. But no, wait – it's already begun in Hurt's head while reading Binoche's intimate diary at her place (it looked rather like one of the paperback poetry books from Gallimard). If that ain't another no-no. How about the acting qualities displayed here? Well, Hurt walks around with a permanently insulted look on his face – could also be a liver problem or constipation –, while Binoche comes off as a likeable airhead. I supppose that's meant to be French esprit. So, if you're in the right mood for tepid romance and stuff borrowed from perhaps a dozen other movies (American and French), go ahead and watch this one. 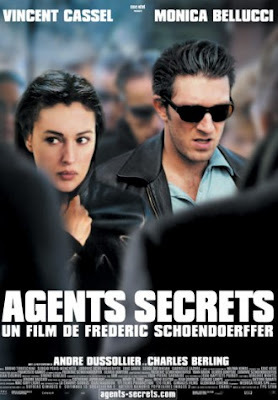 Heute Abend lieh ich mir Agents secrets aus – hauptsächlich, weil ich nach Malèna mehr von Monica Bellucci sehen wollte. Dieser belgische Film von 2004, bei dem Frédéric Schoendoerffer Regie führte, erwies sich als ein schnörkelloser Spionagestreifen, der sich durch seinen Realismus und seine Unterkühltheit angenehm von der typischen Hollywood-Ware abhebt. Er hinterlässt insgesamt eher ein Gefühl von Melancholie und überrascht durch eine subtile Geschichte von Loyalität und Liebe in einer Umwelt, die hauptsächlich von eiskaltem Kalkül und Zynismus geprägt ist. Bellucci ist schön wie eh und je, hat jedoch keine Gelegenheit, in einer durch Desillusionierung mit ihrem Beruf als Geheimagentin gekennzeichneten Rolle nennenswerte Bandbreite zu zeigen. Ein Thriller, der eher düster als aktionsgepackt ist. Nur zu empfehlen. Zu haben im DVD-Verleih oder im Handel, z.B. bei Amazon. "What if there's no tomorrow? There wasn't one today." When I watched this 1993 film again last night (after many years), it struck me how young and smooth Bill Murray looked in it compared to more recent movies like Broken Flowers and Lost in Translation. By the way: Broken Flowers seems like an extension of Lost in Translation in making the actor play a persona that's even more silent and closed up in himself. Those who haven't seen Lost in Translation: go see it. A marvelous portrayal of alienation. And hearing Bill Murray do a karaoke number on More than this by Roxy Music alone is worth it.